The LA Lakers will host the Charlotte Hornets on Friday night in the NBA. The Lakers (33-42, 20-17 home) have been dreadful since the All Star break, when it became pretty clear they won`t make the playoffs this year. Since the All Star break, LA has 13 losses in 18 games, and in fact has been the third worst team in the league over this period of time – with only the Knicks and the Mavs having worse records. The Lakers did show some improvement recently, winning two of their last three games, but on the other hand both of those wins came in accessible home matches against the Wizards and the out of form Kings. Last time out, the Lakers were trashed in Utah by the Jazz a couple of nights ago (without Lebron). The Hornets (35-39, 11-24 away) are involved in a dogfight to catch a playoff spot in the Eastern Conference. The Hornets seemed out of the race at one point, but they recently caught fire. After 4 consecutive wins, they are now just 1.5 games behind the Heat for the last playoff position. A win tonight in LA is almost mandatory for the Hornets if they want to keep putting pressure on the teams above them, while a loss would be devastating for their playoff chances. Bet on Lakers v Hornets and claim a 100% (120 Eur) welcome bonus at LSbet now! 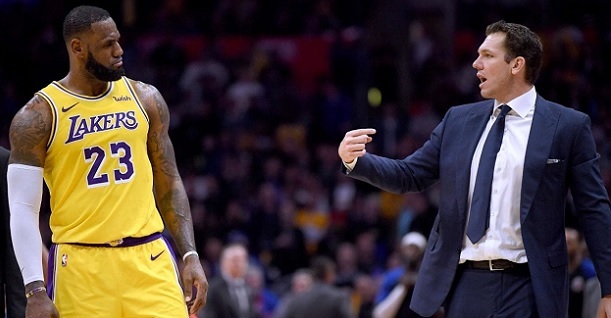 Lakers: Lebron James is listed as probable for the Lakers, but that`s his status pretty much every game these days, with the Lakers having nothing left to fight for. He should play. Hart, Ingram and Ball are out. Chandler and Bullock are questionable, while Muscala is probable. Hornets: The Hornets will be without Zeller, while Parker, Batum and Kidd Gilchrist are questionable (but at least 1-2 of them are low key expected to play). Lamb is probable. The Lakers looked more like an NBA team over the past week with those wins against the Wizards and the Kings, but the team wasn`t particularly impressive in either of those victories, and the opposition was less dangerous than the Hornets will be tonight. Charlotte is really pushing for a playoff spot right now and has played some fantastic basketball recently. Not only are they riding a 4 match winning streak, but those wins came against top class opposition as well. In their last three games, the Hornets beat the Celtics and the Spurs at home, while also winning in Toronto! The Hornets have not been good away from home this season (11-24) and against Western Conference teams (9-17), but those stats lose importance at this stage of the season, when certain teams fight for the playoffs while others have no objective and are tanking for a better draft pick. It`s hard to believe an in form, motivated Hornets side will lose such a capital game against a Lakers side which is the third worst team in the NBA since the All Star Break and which has nothing left to fight for. The Lakers might get their occasional home win against fellow struggling opposition, but beating a red hot playoff bound team seems unlikely. My tip will be Charlotte to cover the -2 (asian) handicap. Prediction: LA Lakers – Charlotte Hornets 105 – 115.